Last week, Mumbles and I had the big appointment. 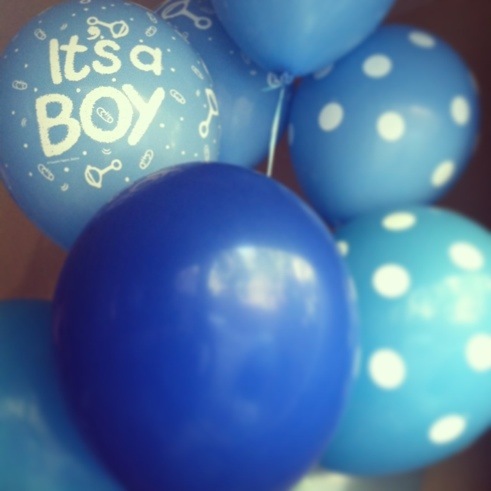 You know, the one where you find out if you’re having a boy or a girl. (!) Our ultrasound tech was nice enough to take about 30 photos of this kid so we’ve got a nice little banner display at home now with a bunch of baby’s body parts featured. So tiny!! What a special moment for us. And, to top it off, it was my dad’s birthday so we were able to celebrate and tell him the news over dinner that evening. He was a bit disappointed having been absolutely certain that this little babe was going to be a girl but I think he’s over it now. Ha! We also had a great little get-together with lots of food, Sprinkles cupcakes, and a few friends and family to share our joy. Mumbles and I are so excited and also a little relieved. You see, we didn’t really care one way or the other for a boy or girl but in conversations about possible boy names, we immediately agreed on many, whereas the girl names…not.at.all. We have a name in mind that I’ve loved for a long time but haven’t decided for certain yet. Naming a human is hard! If you have kids, I’m so curious to know how you decided on the name you chose and if you still like it. Exciting!!! So happy for you both and I can’t wait to meet the little guy! Thank you!! We are so excited! I’m so excited for you both and can’t wait to hear what name you pick!! Thanks Marla! We’ve got a long list but I think we’ll decide we’ll before he’s born. Congrats, Jenn! He is going to be a well loved little man. He definitely already is. Thank you!